Heel spur syndrome (plantar fascitis) is a very common, painful foot disorder that involves inflammation of the plantar fascia, a ligament attached to the bottom of the heel bone. It frequently appears during an individual's most active years, but can occur at any time. Most people with heel spur syndrome complain of sharp pain following rest, and some even develop a limp because of the discomfort. If you or someone you know has heel spur syndrome, just getting out of bed in the morning can be a challenge. For some patients, conservative treatment of heel spur syndrome does not provide acceptable results. And traditional heel spur surgery is simply too painful and debilitating - requiring weeks of recovery. Now, a video-assisted, outpatient procedure, Endoscopic Plantar Fasciotomy (EPF), provides the majority of patients with relief from this painful condition. The EPF procedure allows patients to start walking within hours after surgery - with little or no discomfort. Dr. Michael J. Marcus is one of Southern California's leading experts in EPF surgery. He has performed dozens of procedures with outstanding results. The majority of patients who undergo EPF have complete relief from their symptoms and can resume normal activities within one week. What dies it feel like if I have this condition? Most people who have this condition complain of a sharp pain on the bottom of their heel or arch area. The pain is most severe in the morning and after any period of rest. By the end of the day, the patient is often limping. Often, patients refer to their condition as a "stone bruise." The cause of the pain is due to inflammation that occurs to the ligament that attaches to the bottom of the heel - known as the plantar fascia. This may occur as the result of various factors, some of these being the overall foot structure, certain metabolic diseases, or a change in the patient's activity level or training method. In cases where the ligament has been under greater pull than normal, a projection of bone may occur at the bottom of the heel bone which is commonly referred to as a heel spur. It is important for people to realize that many patients actually suffer from heel spur syndrome, or plantar fascitis, without actually having a true spur on their heel bone. 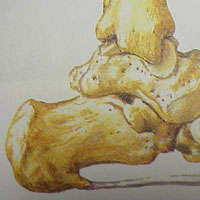 It is also true that patients may have a true spur on the heel without having any discomfort in their heel. Initially, a complete medical history and podiatric examination is conducted, which normally includes x-rays. Following this, conservative care is then instituted. This may include careful and limited use of cortisone injections and physical therapy modalities - including ice, ultrasound and proper stretching techniques. Oral medications are sometimes used as well, and orthotics and proper shoe gear recommendations are prescribed as necessary. ( Rockport Shoes are good examples of appropriate shoe gear ). A device called a night splint is very effective in management of this problem, as it helps stretch the tight plantar fascia. 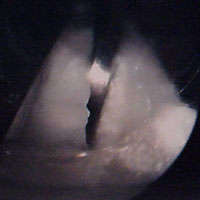 However, if conservative therapy fails, then surgical treatment is suggested. There are several methods to do this. At the present time, the most advanced procedure that we are using is called Endoscopic Plantar Fasciotomy (EPF). 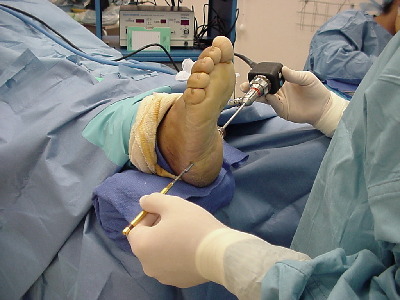 With this modern technique, the surgeon makes a very small incision on the inner side of the heel and inserts a specially designed instrument that allows the ligament (plantar fascia) to be isolated as well as visualized on a television monitor. The ligament is then selectively severed in order to decrease its pull, and this allows it to elongate to a more functional position, thus reducing its pull and subsequent inflammation. Endoscopic Plantar Fasciotomy allows patients to start walking within hours after surgery - with little or no discomfort. The majority of patients have complete relief from their symptoms and can resume normal activities within one week. Dr. Michael J. Marcus is one of Southern California's leading experts in EPF surgery, having performed hundreds of procedures with outstanding results. 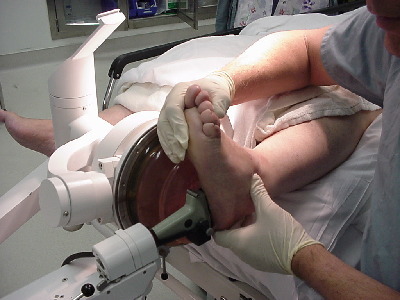 Dr. Marcus has been one of the first foot surgeons to apply shockwave therapy to certain podiatric conditions. Shockwave therapy is best known for its uses in the treatment of kidney stones, referred to as Extracorporeal Shockwave Lithotripsy (ESWL). Research has shown that shockwave therapy applied appropriately is also beneficial for the treatment of several orthopedic and podiatric conditions-this procedure is called Extracorporeal Showckwave Therapy. In October 2000, the FDA granted clearance of ESWT for the treatment of plantar fasciitis (chronic heal pain syndrom). Consequently, with this treatment a patient will be able to return to normal activites in a minimal amount of time.